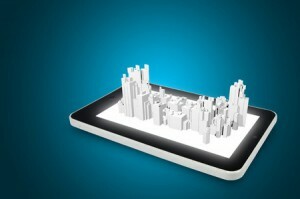 CoreLogic RP Data released its quarterly Pain & Gain Report. Over the December 2014 quarter, 8.6% of all home resales recorded a gross loss compared to their previous purchase price. The figure had fallen from 9.1% over the September 2014 quarter and was lower than the 9.6% recorded over the December 2013 quarter. The proportion of loss-making resales was at its lowest level in December 2014 since the three months to June 2011. The total value of these loss-making resales over the quarter was $418 million and the average loss was $65,435. The data shows that the vast majority of resales (91.4%) recorded a gross profit over the quarter with 32.3% selling for more than double their original purchase price. The gross profit across all profit-making resales was $17.1 billion and the average gross profit across these resales was $251,696. Analyst and author Cameron Kusher noted that making a gross profit or loss on property differs significantly from property-to-property and area-to-area, and in some instances is based on the length of time a property has been owned. 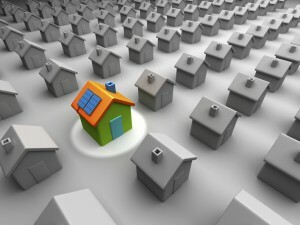 As a stark example, he noted that homes purchased prior to January 1st, 2008 (i.e. pre-GFC) and were subsequently sold during the December quarter of 2014; only 4.9 per cent of resales were made at a gross loss. However, Mr Kusher said that for homes purchased on or after January 1st, 2008, the propensity to make a loss on the resale climbs substantially. Of those homes that resold over the December 2014 quarter, 14.1 per cent recorded a gross loss relative to the previous purchase price. To further illustrate Mr Kusher’s point, for resales incurring a gross loss over the December quarter, the average length of ownership was just 5.9 years. Properties that recorded a gross profit were held for an average of 10.2 years, while those homes that resold for more than double the previous purchase price were owned for an average of 16.8 years. How did the market perform over the past quarter and are more properties selling for a profit or loss? The proportion of loss-making resales has fallen to 8.6% over the Dec-14 quarter from 9.1% the previous quarter and 9.6% a year earlier. Which state/capital city performed the best in terms of profit making sales? 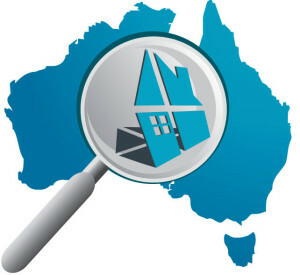 Sydney, Perth and Melbourne have seen the lowest proportion of loss-making resales. Sydney and Melbourne in particular are reflective of the fact that these two cities are currently seeing the strongest growth in home values. Similarly Regional NSW and Regional Vic have recorded the lowest proportion of loss-making resales across the regional areas. Do you expect that trend to continue? Sydney and Melbourne along with Regional Vic and Regional NSW are expected to continue to see a trend towards fewer loss-making sales as the growth in home values persist. Perth on the other hand is likely to see an increase with the rate of home value growth having slowed sharply over the past year. For units, which state performed the worst and why do you believe that is the case? Amongst the capital cities it was Hobart and this is reflective of the ongoing weakness across this market over the past decade. Across regional markets it was Qld and again this is reflective of the long-running weakness in coastal markets and the recent weakness being experienced in regions linked to the resources sector. Around the country, today’s quarterly Pain & Gain report findings show that Sydney, which has also been the strongest market for capital growth over recent years, recorded the lowest proportion of loss-making resales at just 2.4 per cent over the December 2014 quarter. Other regions with a low proportion of loss-making resales were: Perth (5.5%), Melbourne (5.6%) and Regional Victoria (8.1%). Sydney: Only 2.4% of homes resold in Sydney over the final quarter of 2014 sold at a loss, down from 3.5% a year earlier and 2.5% at the end of the previous quarter. The Botany Bay and Hunters Hill Council areas each recorded no resales at a loss over the quarter. The Wyong (6.8%), Pittwater (6.0%) and Gosford (6.0%) council areas each recorded the highest proportions of loss-making resales throughout Sydney over the quarter. 5.6% of Melbourne resales over the December 2014 quarter were at a price lower than the previous purchase price, down from 6.0% a year earlier and lower than the 6.7% the previous quarter. The Murrindindi council area was the only region across the city to record no resales at a loss over the quarter while loss-making resales were also rare in Maroondah and Whitehorse (both 1.7%). The regions with the highest proportion of loss-making resales were Melbourne (17.3%), Melton (11.8%) and Whittlesea (11.0%). Across Brisbane, the proportion of loss-making resales has trended lower over recent months and was recorded at 10.5% over the December 2014 quarter, down from 10.9% the previous quarter and 13.0% a year earlier. The Brisbane Council area has a significantly lower proportion of loss-making sales compared to all other regions at 6.2%. The council areas with the highest proportion of loss-making resales were Lockyer Valley (28.6%), Scenic Rim (27.0%) and Ipswich (18.4%). Over the December 2014 quarter, 8.9% of Adelaide resales were at a gross loss, which was the lowest proportion since the 12 months to November 2011. 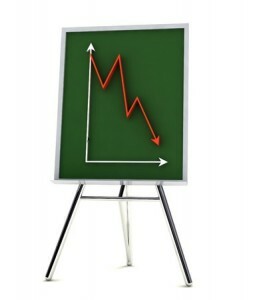 The proportion of loss-making resales is down from 11.9% a year earlier. The Mallala (0.0%), Unley (1.3%), Adelaide Hills (3.4%) and Campbelltown (3.4%) council areas recorded the lowest proportion of loss-making resales. Meanwhile, the Playford (23.6%), Light (12.5%) and Adelaide (12.3%) council areas recorded the highest. 5.5% of resold homes across Perth in the December 2014 quarter were sold for less than the previous purchased price compared to 5.4% the previous quarter and 4.1% a year earlier. The Canning (1.4%), Bayswater (1.8%) and Nedlands (2.0%) council areas recorded the lowest proportion of sales at a loss. The highest proportion of loss-making resales occurred in the Peppermint Grove (50% (only 2 sales in total)), Mandurah (15.3%) and Murray (14.0%) council areas. Hobart’s historically weak housing fundamentals see it having the highest proportion of loss-making re-sales of all capital cities (15.5%) over the December 2014 quarter. 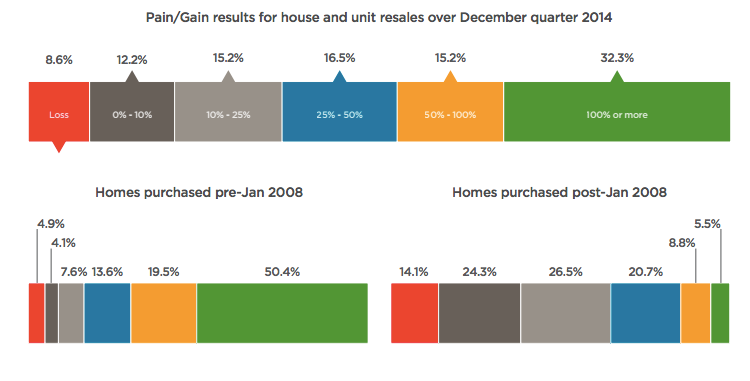 The proportion of loss-making re-sales is lower than the previous quarter (16.3%) and the previous year (16.5%). Derwent Valley (33.3%), Sorrell (24.2%) and Brighton (22.6%) council areas had the highest proportion of loss-making resales over the quarter. The proportion of loss-making resales was much lower in Hobart and Kingborough (both 11.9%) and Clarence (15.2%) council areas. Across Darwin over the three months to December 2014, 10.3% of homes resold at a loss compared to 9.5% at the end of the previous quarter and 7.7% at the end of 2013. 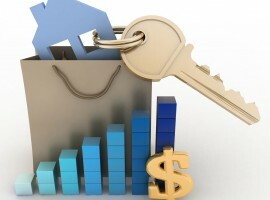 The proportion of loss-making resales has recently been lower and is trending higher. The relatively less developed Litchfield region recorded no loss-making resales over the quarter compared to 5.6% in Palmerston and 14.5% in Palmerston. Over the three months to December 2014, 10.8% of Canberra homes re-sold at a loss compared to 11.7% over the previous quarter and 7.7% a year earlier. Based on current housing market conditions we would expect that over the coming quarters the proportion of loss-making resales will continue to trend lower. This trend is likely to continue to be more evident within the capital city markets rather than regional areas which are generally recording decidedly weaker overall housing market conditions.